Shellbelle's Tiki Hut: Dorothy, Where Are We? It was 29 degrees at The Hut yesterday morning and it stayed in the 40s all day before dipping back down to the lows 30s last night. Now I know that many of you out there are thinking to yourselves that Floridians are a bunch of whimps when it comes to these kind of temperatures. I know that in many parts of America and the world it is much colder, you have snow covering the ground, the wind chill factor makes it unbearable and you are facing your own set of problems, but don't count us out. We have a unique set of problems when dealing with the cold weather, some of which will eventually trickle down to you, my faithful readers. Problems like iguanas falling out of trees. First I'll make this about me. I suffered through the summer heat, the kind of heat that makes it impossible to be able to enjoy the great outdoors. The kind of heat and humidity where you can't open the windows and the a/c runs 24/7. If you don't follow this practice, you end up with soggy sheets, rust and mold. I wait for winter, when I can throw open the windows and let the fresh air in. I wait for the days I can don my bathing suit and head down to the beach without worrying about passing out from the heat. This is my favorite time of year — usually. Not this year though, definitely not this year. Typically I live in shorts and tank tops, that makes up the majority of my wardrobe. When the winter months hit, I switch to tops that actually have sleeves and even put on a pair of jeans now and again. I do have a few sets of sweats and a pair of fleece pants from Old Navy that I love. Heavier clothing is of the type you wear when you go visit friends and family in cold country, not what you wear to hang around the house. We are very casual around The Hut. I had to pull down storage boxes that contain hats, scarves and gloves. My discomfort is nothing compared to what is going on around Florida, you know, Florida — The Land of Sunshine. Like I said, we have a unique set of problems when we dip down to these types temperatures. I'm sure you've all heard about the citrus farmers and the challenges they are facing in protecting their crops. Did you know that Florida produces 75% of America's oranges and 40% of the world's orange juice? You can expect prices to jump up and supplies to be limited. We won't know for several weeks how extensive the damage will be, but from all accounts, it won't be pretty. Not having orange juice may not seem like that much of a tragedy to you, but think of the jobs and revenues lost. In this already tough economy, it is a tragedy for many of our residents. Update: I just heard on the news that the entire kumquat crop in Florida has been lost. The strawberries are trying to hang on and the tomatoes have suffered major losses. Over in Loxahatchee, one tropical fish farmer (the fish that fill aquariums and delight those who own them) lost about 100,000 fish, his entire business. He is just one of 100s of tropical fish farmers in our state. Then you have to think about our wild fish population. These fish are used to tropical waters, that's why they're here. How has it affected them? I've already heard there are fish kills (where they die and wash ashore) up and down our coast, but I don't know the extent just yet. What about our tropical plants you ask? We have the most amazing tropical plants here in Florida, most of which can't be grown in other areas of the United States. Some will simply turn brown, the leaves will fall off, but they'll eventually grow back. It won't be pretty for a while, but they will grow back. At least some of them will. Others will die, they just can't take it. My beautiful 18-year-old plumeria tree will probably not survive. If it does, I will be surprised. 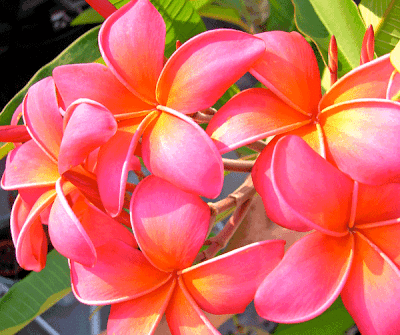 According to every plumeria society, they will not survive below 40 degrees for this amount of time. On Saturday I went out and cut about fifteen large limbs and brought them inside. The cut will heal over and hopefully when Spring arrives I can plant them and they will grow. But my 12-foot multi-branched tree is probably gone for good. I shared many pictures of my tree over the summer with you, I can't bear to show you a picture of what it looks like now. Then there are my banana trees, bromeliads and many more. Will they come back? I don't know. What will happen at the Florida Botanical Gardens, you know, the place I love to visit. Some plants will be lost, hopefully most will survive. Time will tell. Then we move on to our wildlife and the effect of the cold on some of them. We love our sea turtles, which are already endangered. Only about one out every 1000 hatchlings survive and there are many Florida residents who walk the beaches in the early morning hours during egg-laying season to spot nests and make sure they are cordoned off and protected until they hatch. We have stiff laws here to protect our sea turtles, but it's hard to protect them from the cold. Sea turtles become lethargic in cold water and can't swim. The last count I heard was that so far over 700 have been found washed ashore and taken to local zoos, aquariums and wildlife centers to be nursed back to health. They will be released back into the wild when temperatures warm back up, but their immune systems are compromised from the cold and who knows what will happen to them in the future. 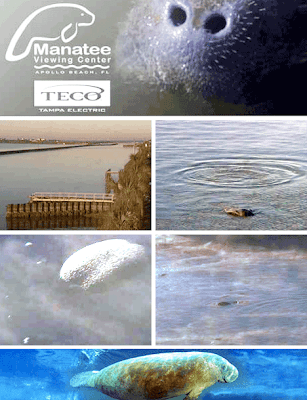 Our manatees and rays flock to the warm waters at electrical plants and they are coming in droves. About an hour from me is Tampa Electrics plant at Apollo Beach. The area is known as being a habitat for manatees in cold weather and they have built a beautiful viewing area where you can watch our gentle giants in the wild. Hopefully the majority of our manatee population have made it to their winter home. I took the four photos in the middle of this mosaic through the web cam at Apollo Beach this morning as the sun rose. Is there an upside to this cold weather? Yes! Now some of you make think this is cruel, but I want you to think about how you would feel if these critters lived in your neighborhood. I'm talking about pythons and iguanas. Nice to see at the zoo or in National Geographic magazine, not so nice to see in your neighborhood. On Gazparilla Island, it is estimated that there are 10 iguanas for every human resident. The females lay between 80–100 eggs at a time and they lay about three times each season. They are not native to Florida, but were brought in by some stupid resident in the 70s who eventually released them in the wild. 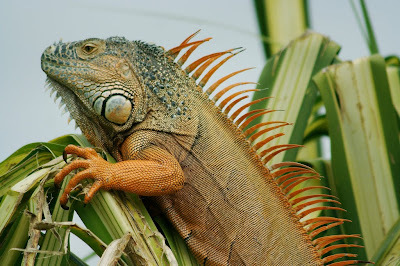 Iguanas have no natural predators in Florida, so it is up to man to get rid of them. When the weather get this cold they go into shock and can't hold onto the branches of trees. Hope your not standing under a tree when this happens or that your car is not parked under one. These instances make it easier for wildlife officials to capture and euthanize this invasive species. Iguanas are 2–3 feet in length, I don't know how this cold in affecting the monitor lizards, which can grow to be 6-feet in length. I remember reading news stories where residents have found these critter in their backyards or garages. Specking of non-native critters, did you know we also have a python problem in Florida? Yes, the exotic pet import trade has lead to pythons being released or escaping and setting up residence in our state. Devastating hurricanes also lead to people's pets finding their way out of capture. The population in the Everglades is estimated at about 200,000 and they are trying to keep this population under control. They know that complete eradication is next to impossible. There was a famous photo that circulated in 2005 of a python that had exploded while trying to eat a 6-foot alligator. Alligators we're used to, pythons — not so much. Wildlife officials are hoping that this cold snap will make it easier to capture these elusive pests. I'm hoping for that also. Like I said, would you want something like this in your neighborhood? This is why our legislators are fighting to pass a bill outlawing the importation of these types of exotic pets. They love our tropical environment as much as we do, but this is the type of tourist we don't welcome. Speaking of tourists, you know this cold weather has to be affecting our tourist trade. This is the time of year many of you are abandoning the snow and cold and heading to the sunny, warm beaches of Florida. Well, you better give it a while longer, 30 degrees at the beach is no picnic. What's the outlook? After weeks of cold temps and a week of devastating cold, we are expecting temps in the low 70s this weekend. Ah, sounds like a good day for the beach to me — finally! Hope your staying warm where you are and that you don't have to worry about iguanas falling out of your trees. Right now, I think I'd rather be in Kansas! We can't control the weather for sure! Now, I'm kind of glad that I canceled my Miami trip because I would have been down there this month. And I can say to you..., stay warm!! Thanks for the VERY nice and enlightening report from a Floridian's perspective..So many folks truly have no idea the extent of losses due to cold weather and the impact it can have on all aspects of the economy. Homes there are not built to withstand cold..so bundle up and stay as warm as possible..
pretty soon, you'll be able to fling open the windows and enjoy your beach again..and I'm saying a prayer for the plumeria tree.. I must admit, I haven't given your cold temps much thought beyond my family freezing. (Dad doesn't even have a furnace and my brother's only transportation is a bicycle.) This cold snap must be devastating to your economy! The tourist industry is such a large percentage of it. I'm glad the temps will help control the unwanted varmints. It makes me very angry that they can import these creatures and that idiots release them. Once I found a piranha washed ashore at a lake where we spent every weekend. Fortunately, those waters are far too cool to support them. What kind of idiot would do that? Nice and different post. You are giving us the effects of rather cold weathers which I have no idea..Poor iguanas.. This is such an interesting post. I had no idea of the implications of such a cold spell. I am amazed that so many things will suffer. It's so sad. I hope that your special trees and bushes manage to survive. I will show this post to my daughter (age 13) as she will be interested in all this too. Her friend is on her way home from Florida at the moment. I am sure she will not have been able to enjoy all the waterparks during her visit. When we visited Florida I was always looking for snakes but I never thought an inguana might fall out of a tree onto me. eeeeeeeeeeiiiiiiwwwwwwwwwww!!! Something for me to worry about next time. I really don't know what's happening to the world weather at the moment. My heart goes out to our farmer's! Can't imagine how difficult this season is going to be for them! I left chilly FL for even chillier New Orleans, brrrrrr...then came back just in time for it to get just as freezing cold here - ack! Now, she just wants it over! She did say that Disney has been making a killing on sweatshirts! Hi Shellbelle, I was worrying last night while watching the news and thinking of all the orange groves, tourists and lack of money going into the state due to tourists canceling their trips. So much can go wrong due to the dangerous effects of the weather. Thanks for making us all aware that it is so much more than a day at the beach in Florida...We need our delicious and healthy Florida orange juice and more from wonderful Florida. ps, I got my t shirt today and I LOVE it , thanks for all your help. I ended up with white and pink lettering. It is so adorable. I can't wait to wear it!! This is a great post Rhonda, very informative. We have extremes in weather here, minus temps in the winter and triple digits in the summer, but we are used to both seasons. I grew up in Georgia and spent a lot of time in Florida. I know these temperatures have to be devastating to everyone. I was talking to a friend down in Sarasota this afternoon and we were discussing the crops. The loss will affect the entire nation. Stay warm and hopefully it will get back to normal very soon. I am soooo looking forward to Friday...and the warmer temps! Your post was so informative. You are correct...people in other parts of the country have little to no idea the extent damaging weather does to FL's economy. My eldest son works for a fabulous St Pete restaurant...usually makes $150-250 a night in tips. This week he made just over $400 for the week! I truly feel for the fruit and veg. growers and their pickers who are working around the clock, outdoors in this freezing weather, trying to save or salvage whatever they can. I hope you were able to save your plumeria...does it root from cuttings? Keep us posted. It is such sad news Rhonda! The NY Timers had an article today about the tropical fish farmers losing much of their stock due to the cold. NYC winter has not been any worse thsn normal so far. I feel fortunate about that. I hope Florida warms up soon! Fingers crossed that your plumeria tree survives! Great post, Shellbelle, so many people don't realize what cold weather means to the south. And especially FL. My heart goes out to the farmers and the devastation this cold does to the industry. Thanks for informing others and for telling it like it is. I have been thinking of FL and your weather ...such hope it gets better!! I hope it gets warmer like it is projected to me and that our poor sea creatures stay safe and sound! Kansas is super cold, you don't want to go there, lol. CA however has been rather nice. You should come and visit. The idea of iguanas falling out of trees just has me in laughing fits for some reason! Ditto the python choking on the 'gator! lol! The cold front has been a big problem in Europe as well, but most of the continent is +/- adapted to it. In Alicante we've enjoyed the chance to go play in snow, but we'll all be crying over the heating bill soon (those of us lucky enough to have heating). The only major problem I've heard of is the artichoke crops. :o( My favourite vegetable!!! Fortunately most of them were picked before the frost so should be an +/- ok season, and those that remain will just be ugly (but not ruined). Other parts of the country are definitely suffering more. And I hear you about not being adapted to the cold! I've got all the cold weather gear I could want (except for ski pants), but I don't relish the idea of having to wear layers and layers inside my house because of an inefficient heating system!